Between puppy issues and being overwhelmed at work –I’ve definitely been off the grid lately. However, one thing that I have been doing is eating. A lot. Sigh. When I’m stressed, I rarely ever resort to food, it’s the opposite. However, my body has been just craving anything and everything lately. So I’ve given in. I definitely am one of those people who say when she overdoes it, “well, it’s AIP or Paleo.” However, as we all know, too much of a good thing is not good, even if it is clean. Sigh. That’s how it’s been for me and my week long love affair with almonds. I’ve somehow managed to sneak almond products in my daily intake for the last 14 days and my skin looks like absolute hell because of it. Eczema patches on my legs, arms, and now stomach (which has never happened). Sadly, I knew right then and there that it was time to pull back on the reigns and get back on being strict AIP. Coconut flavored desserts aren’t nearly as delicious as a nut filled treat, but I threw some diet compliant chocolate on there to satisfy myself and anyone else with a sweet tooth. Some AIP-ers argue that cacao is not AIP, however, if you’re body can tolerate it like mine, eat away. Mix the first four items together in a bowl. Every round I try this recipe is different, so don’t be afraid to adjust the ingredients if it’s too soupy or too dry). Once finished mixing together, roll into golf balls and place on wax paper; put in fridge for about 30 minutes-1 hour (or whenever hardens). Remove macarons from fridge and set aside. 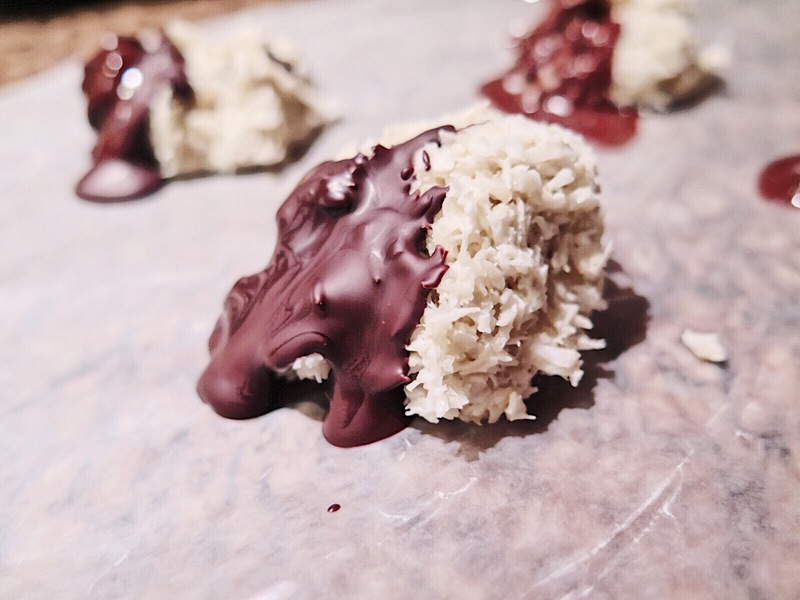 Slowly melt the chocolate on a stove top or microwave and then drizzle (or dunk) on top of the cooled coconut clusters.